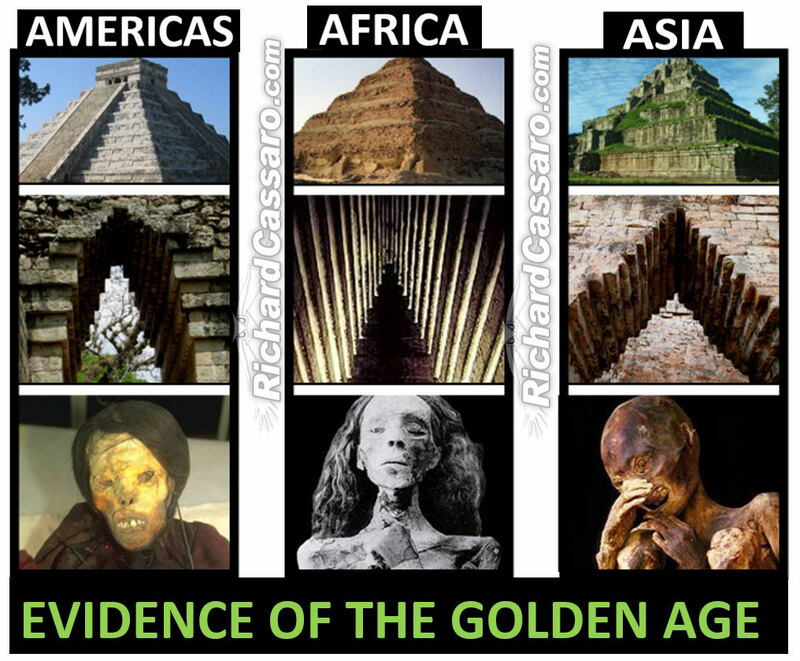 The Missing Link—Evidence of a Lost Civilization? 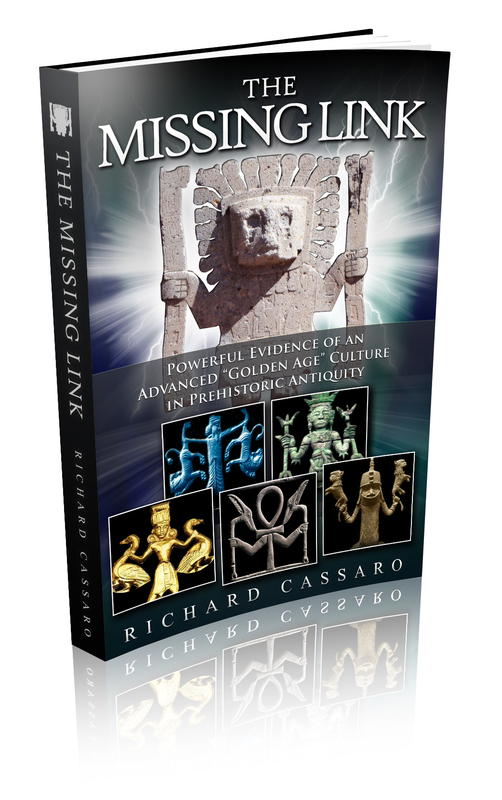 A major discovery set forth in my new book, The Missing Link, has the potential to upend everything we learned in school about ancient civilizations and ancient religions. 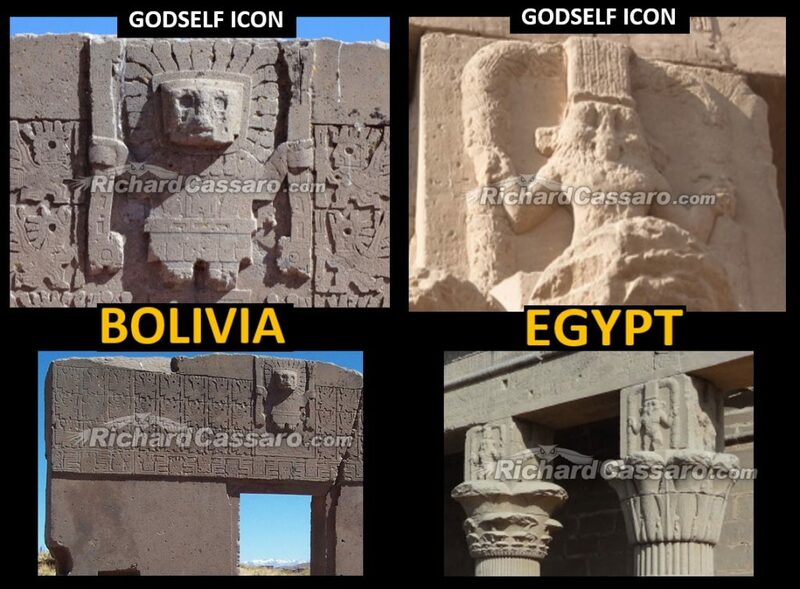 “GodSelf Icons,” a prominent feature of most ancient cultures, cast serious doubts about conventional theories of human spiritual evolution and the emergence of civilization. 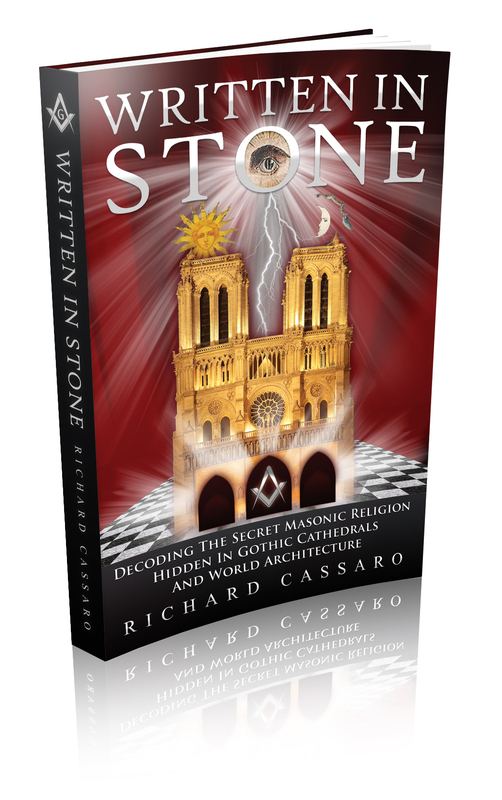 I first set forth my initial discovery of the GodSelf Icon in my 2011 book, Written in Stone. Since then, I have found even more powerful reasons to focus attention on this remarkable pattern. My new e-book, The Missing Link: Powerful New Evidence of an Advanced “Golden Age” Mother Culture in Remote Prehistory, provides a more in-depth analysis of my GodSelf Icon discovery. 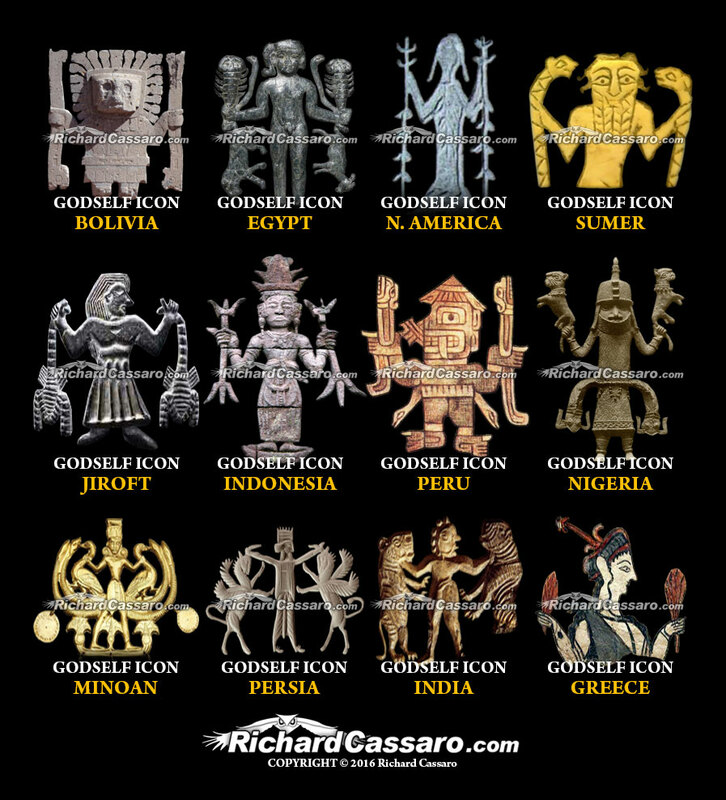 The GodSelf Icon is a depiction of a central figure, a forward-facing man or woman who holds in his/her hands outward from the body either a pair of animals or a pair of staffs symmetrically. These twin objects stand for opposing principles, and the central figure represents the hero or sage who combines those two opposing principles to create a spiritual balance that opens new doors of perception and creates centeredness of being. Students of the occult will immediately recognize in this description the age-old coincidentia oppositorum (“coincidence of opposites”) concept. This is one of the central meanings of the GodSelf Icon, as we’ll see below. 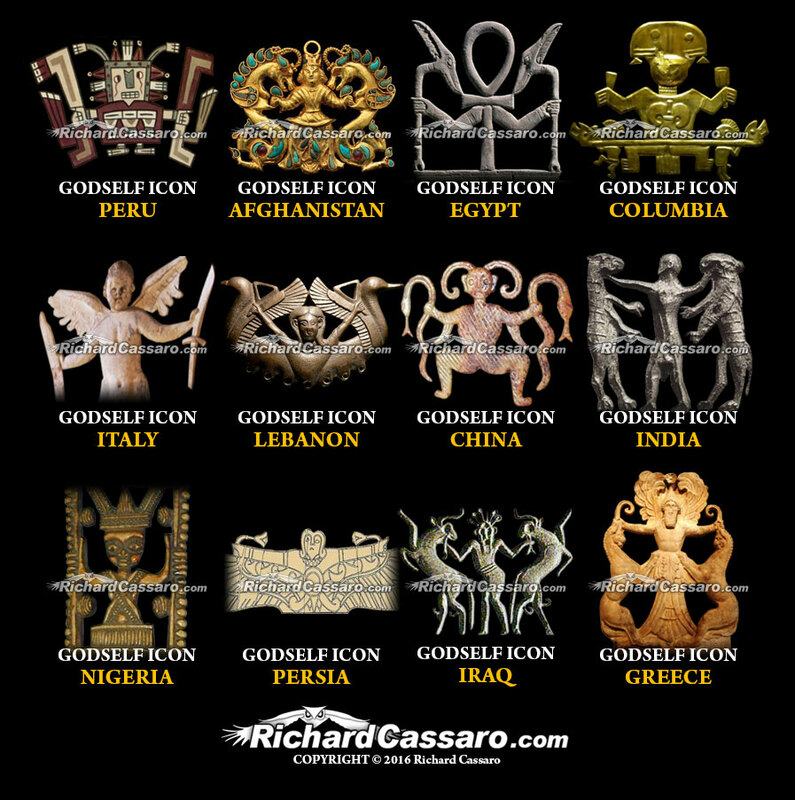 The GodSelf Icon is a central feature of art and artifacts found in ancient Egypt, Assyria, Babylon, Peru, Mexico, Columbia, Costa Rica, Africa, China, Cambodia, Mesopotamia, India, Crete and many other places. 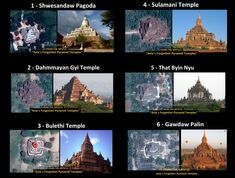 In almost every one of these civilizations, the GodSelf Icon can be traced back to a very ancient and formative era. The further back in time we look, the more we see the GodSelf Icon. 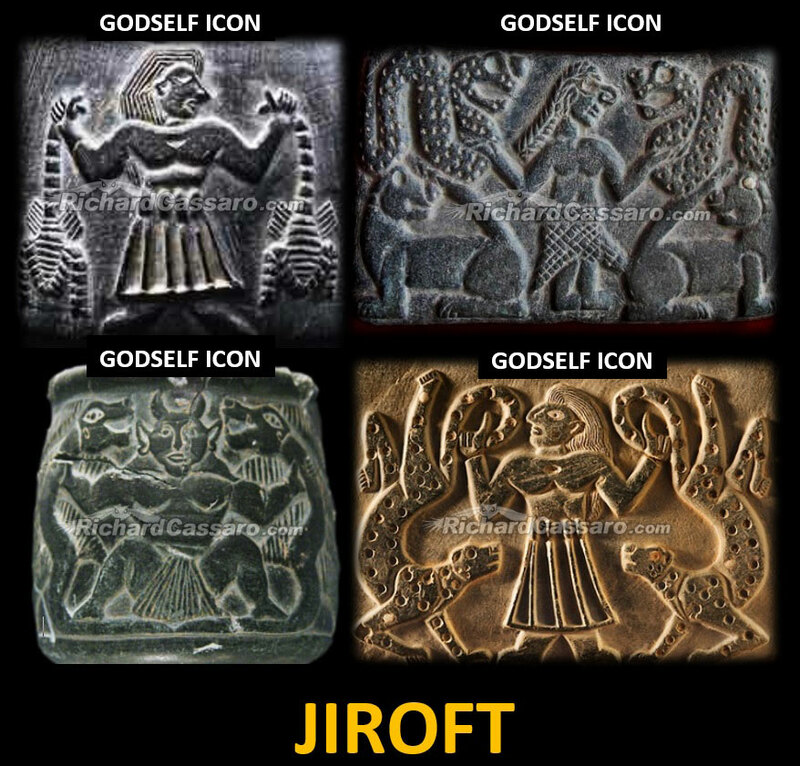 GodSelf Icons from Jiroft, 3rd millennium BCE. 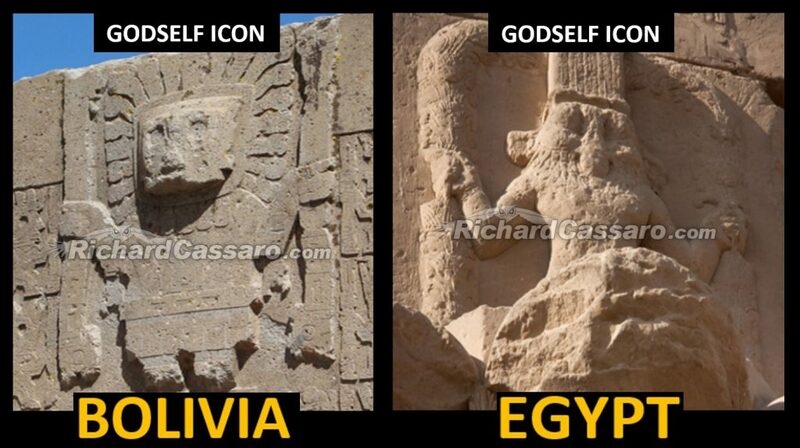 (c) failed to connect (a) and (b), and thus remain unaware that THE “GODSELF ICON” IS THE LOST SYMBOL OF AN ANCIENT UNIVERSAL RELIGION once known worldwide. My book presents multiple comparative analyses of GodSelf Icons that stem from cultures that have long been considered alien from each other by heritage or through lack of trade possibilities. The similarity between the images above is truly striking. Not only is the overall shape a perfect match, but even the small details are a perfect match—the parallel hands, elbows, squat body, and elongated “staffs” in each hand symmetrically. This rock-cut image of the Egyptian god Bes bears a strong resemblance to the stone engraving of Viracocha on the Gate of the Sun in Tiahuanaco, Bolivia. 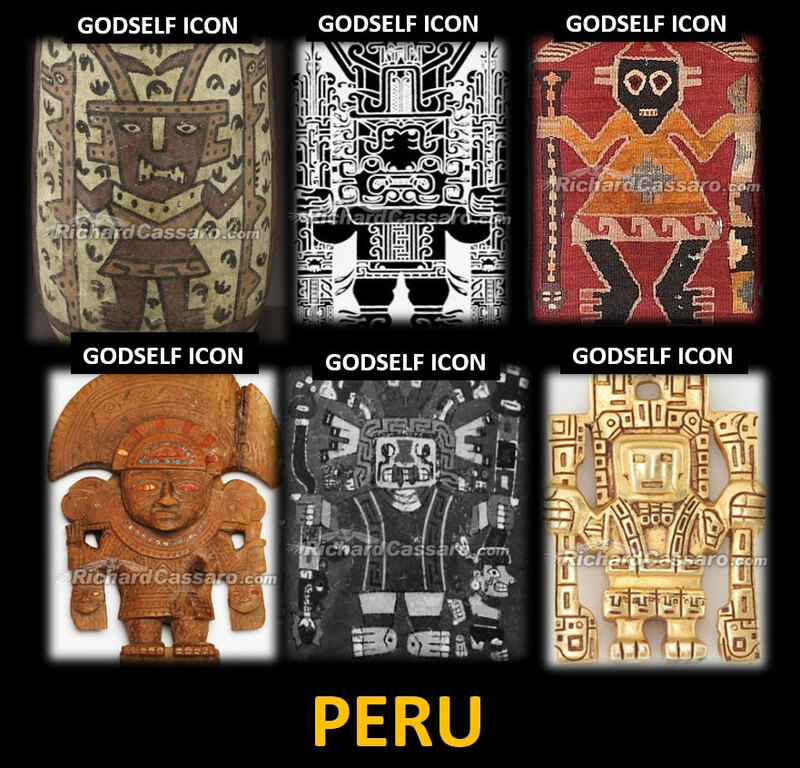 Stylistic differences aside, the ancient Egyptian master masons (in North Africa) who created this GodSelf Icon, named Bes, and the ancient Tiahuanacan master masons (in South America) who created the GodSelf image in Bolivia, named Viracocha, seem to have been working off the same basic blueprint. Each would have recognized the other’s GodSelf icon as such. By extending both arms and hands outward from the body, the GodSelf Icon conveys the concept of duality—an idea expressed by the twin objects depicted “symmetrically” in each hand (twin serpents, twin staffs, twin animals, etc.). Standing between the representations of duality, the hero figure marks the “center” or “balance” point, thus giving us the central message of the GodSelf Icon—to find the center between the opposites. Rebis from Theoria Philosophiae Hermetica (1617) by Heinrich Nollius. Sun (and Masonic compass) in the right hand, Moon (and Masonic square) in the left hand. The icon has two heads. Male right, female left. The true secret about God is that there never was an outward God in the biblical sense. The only god is you, the inner you (your spiritual “soul”) as opposed to the outer physical you (your material “body”); but you have amnesia of who you really are. Noted American Theosophist Alvin Boyd Kuhn once wrote, “Man is a god in the body of an animal according to the pronouncement of ancient philosophy…” The truth of that statement was known in ancient times and has been preserved up to the present, in defiance of religious orthodoxy and superstition, in large measure thanks to the careful safeguarding of ancient spiritual truths by Freemasons and other members of Secret Societies, which conveyed this idea using the same GodSelf Icons. Discovering the Rebis was an important moment for me because it was clear that the Rebis is a modern version of the ancient GodSelf Icon motif. 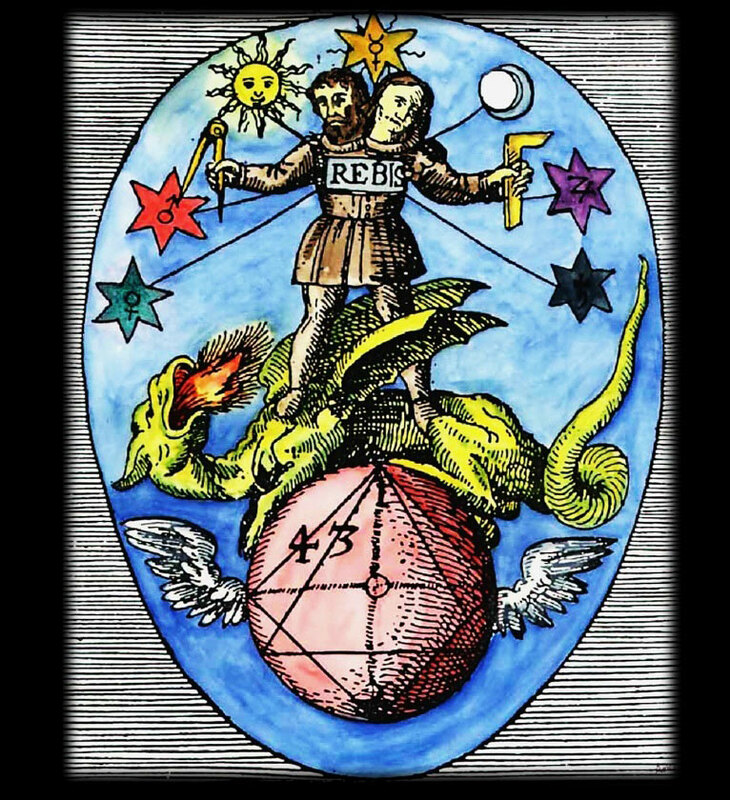 I began learning about the Rebis´ significance in esoteric manuscripts, which described the sun and moon in the Rebis´ hands as emblems signifying duality. 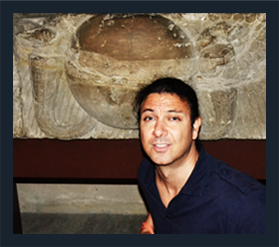 When I applied this key to ancient cultures, their GodSelf Icons began to come to life. In Written in Stone, I presented evidence supporting the idea that an earlier “Golden Age” mother culture now lost to time—Graham Hancock’s “lost civilization”—may have been the common thread that united these cultures. As Plato saw it, the Atlanteans were sophisticated because of their identification with their own “divine” nature, rather than their “human” traits. In The Missing Link, I put forth the idea that the GodSelf Icon is a memory of this divine nature in man—a way to remember the divinity within the body. In ancient Greece, the story of Demeter and Persephone, one of the foundational myths of Greece, is closely related to this idea. The Greek gods descended in large part from Demeter, goddess of the harvest, who preceded most of the Olympians, and whose oldest images are represented by GodSelf icons. Demeter, Goddess of Harvest, depicted as a GodSelf Icon, Roman, Augustan period. Demeter’s young daughter Persphone strayed one day from her home in Arcadia (heaven) while picking flowers in the green fields. Suddenly, Persephone “fell” into the Underworld; Hades below had made the ground open to swallow her. Overcome with sorrow, Demeter searched for her daughter ceaselessly, preoccupied with her loss and her grief. The seasons halted; living things ceased their growth, then began to die. A desperate Demeter pleaded with the Supreme God, Zeus, to free her. Zeus concluded that if Persephone had not eaten of the fruit of the lower world, she could return to Arcadia. But if she had, she would have to live a part of each year in the Underworld with Hades. Persephone had indeed eaten a pomegranate while in the Underworld, condemning her to return below for a fraction of each year. 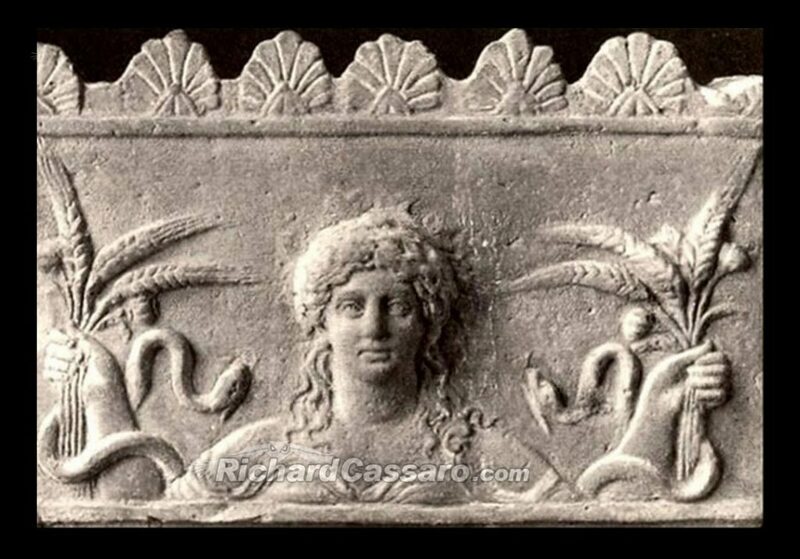 Persephone’s time spent in the underworld is thus linked to Fall and Winter, and her return to the upper world with Spring and Summer. To interpret this myth correctly, it’s necessary first and foremost to understand that the myth does not describe anyone or anything external to you. The myth is all about you. It simultaneously describes the dichotomy of your immortal spiritual condition and your mortal human condition. Demeter symbolizes your soul (the divine element in you, as Plato would say) while Persephone symbolizes your body (the human trait, according to Plato). Demeter, your soul, is eternal, powerful, wise and divine. Persephone, your body (who is the offspring or “child” of Demeter just as much as your body is the offspring or “child” of your soul), is naïve, unwise, playful and blissfully ignorant; as such, Persephone is subjected to, and indeed becomes a victim of, the pull and passions of material earthly existence. As evidence of this Demeter/Soul vs. Persephone/Body interpretation, the myth clearly compares and contrasts the higher world of heaven where Demeter resides with the “underworld” or lower world of earth, where Persephone eventually resides. The myth teaches that we’ve fallen from Heaven down to the Underworld (earth), just like Persephone. We have eaten – and we continue to eat – the fruit of this lower world, with its myriad seeds. When we die, we leave this place and ascend back to the source. But, having eaten of the fruit, the soul will necessarily gravitate back down again because, in the words of Socrates, “it is always full of body when it departs, so that it soon falls back into another body and grows with it as if it had been sewn into it.” This is the cycle of reincarnation, a central teaching of the Mysteries. It is an almost endless cycle that will continue until, after learning “the lessons of material/earthly life” we cease to identify with the material bodies we acquire during incarnation and begin to find our true inner Self – the soul. There is a parallel to this in the ancient Zoroastrian religion, founded by the prophet Zarathustra (Zoroaster), which sees the world as an arena for the struggle of the two fundamentals of being, Light/Good and Darkness/Evil, represented in two antagonistic divine figures: Ahura Mazda on the side of good against Ahriman on the side of evil. “… the phenomenal world exists of a pair of conflicting opposites: light/dark, truth/falsehood, health/sickness, rain/drought…life/death, heaven/hell. The so-called “god of time and eternity,” Zurvan, is described by scholars as the “neutral father” of the “good” god Ahura Mazda and the “evil” god Ahriman. 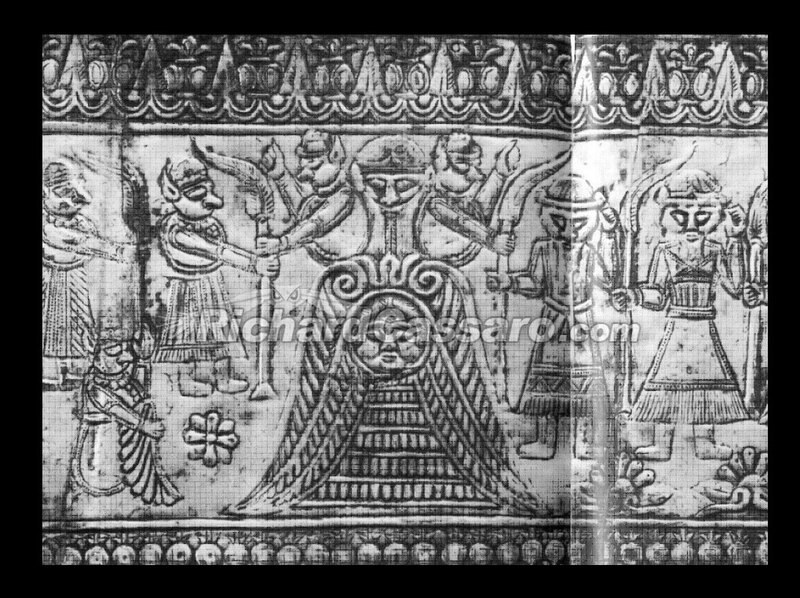 These twins are born and emanate from either side of him, as shown in this image from an ancient silver plaque. With his children representing the two opposites, Zurvan is “centered” between them, facing forward. Zurvan’s neutrality between opposites is personified here by his striking the GodSelf pose. He appears to share an arm with both Ahura Mazda (good) and Ahriman (evil), and he is said to be passing along one flame in his “good” hand and one in his “evil” hand. But Zurvan is neither good nor evil; he is the eternal being between these two temporal opposites. He is neutral. Zurvan is for this reason referred to as the god of light and darkness, good and evil, right and wrong, and so on. In fact, those aren’t his arms, though they appear to be. 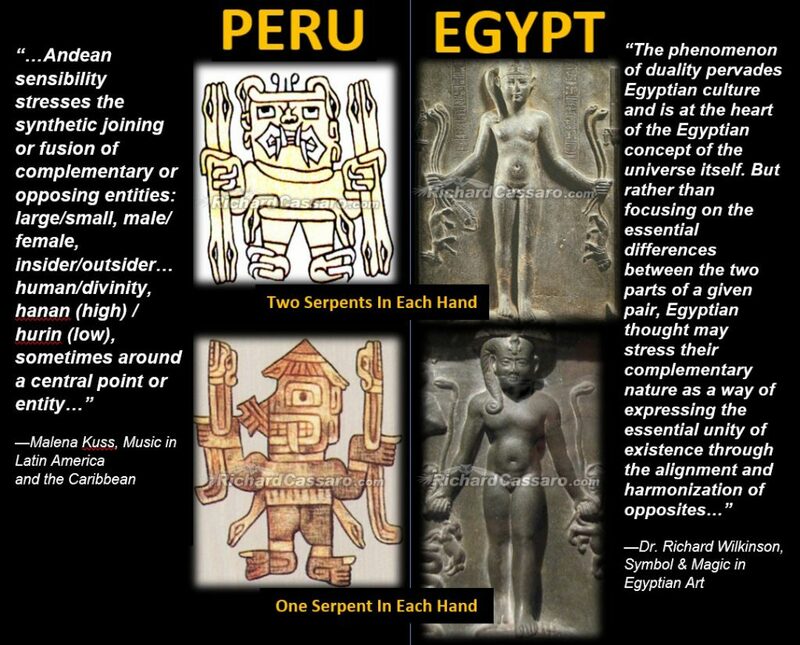 They are the arms of his two lower halves—his left and right sides, good (Ahura Mazda) and evil (Ahriman), that appear to be emanating from him, like the twin male and female faces that emanate from the Buddha. Zoroastrianism emphasizes high moral standards, with salvation achieved by he who strikes the balance and realizes that he is neither good nor evil; rather, he is the eternal being temporarily experiencing these terrestrial apparitions here in the material realm. Ahura Mazda is not a personal god like the God of the Bible, but more of a template that encodes wisdom pertaining to the physical and spiritual constitutions of every man and woman. Zurvan is also a model that the masses should strive to follow. Worship is centered on this idea, not on a personal relationship with God. 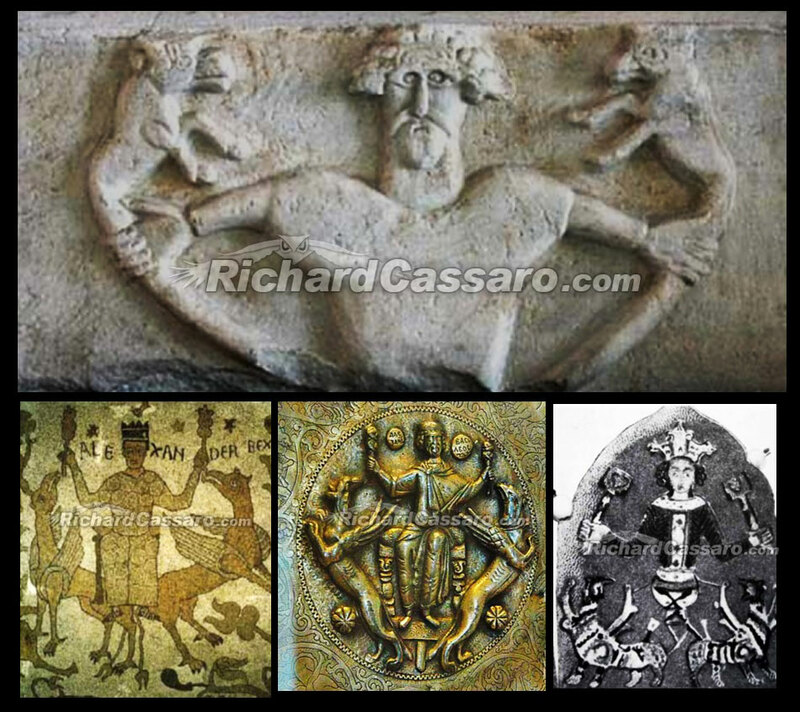 Images of Alexander the Great striking the GodSelf Icon pose. Religion for the ancients was not a homogenizing force as it is for most believers today. Your purpose as a spiritual being is not to obey the dictates of an age-old set of rules, nor to pray in prescribed sentences at certain times of the day, nor to sit with a massive group of other like-minded people nodding heads at the time-worn platitudes of a priest. Instead, the GodSelf Icon calls upon us to develop our talents to the fullest, to meditate about and act upon our individual purposes (our Will), and to become the greatest exemplars of our highest purposes. We are not sheep to be herded by priests; rather, we are independent self-sufficient spiritual beings who have a purpose that transcends our bodily functions and social needs. 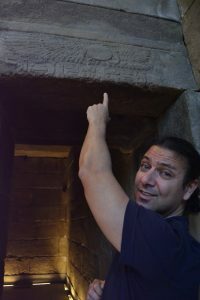 The Missing Link builds on the case I made in Written in Stone, to show that one of the most important symbols in human history has been overlooked and misunderstood. What’s more, that symbol, properly appreciated, is as powerful for people today as it was for our Stone Age ancestors. 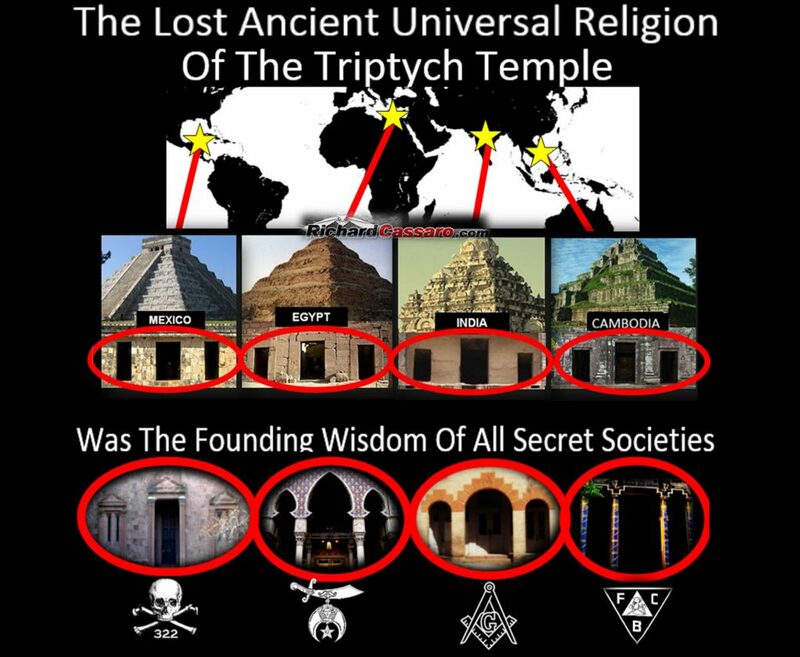 In fact, one of the spurs to my interest in ancient civilizations was my chance acquaintance with the Freemason movement. 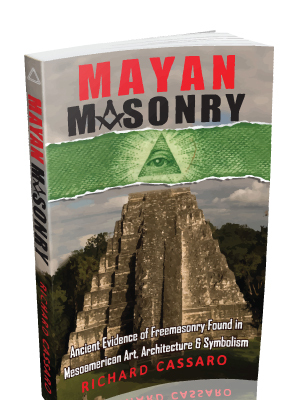 Freemasons consciously imitated past symbols in a way that stressed spiritual concepts. I feel immensely grateful that they did so in a manner that preserved something of the past that would otherwise have been completely forgotten.